The Gauteng Big Band Jazz Festival is being visited by the A-list of South African Jazz musicians who will be performing under the name alumni|city. Under the baton of producer, composer and trumpeter Marcus Wyatt who is known for ‘inventing some new and challenging the boundaries set out by current commercial definitions of jazz’ (jazzreview.com), a team of greats will be performing as part of the festival on Saturday 10 September at St Mary’s in Johannesburg. alumni|city is a project band that includes some of our most respected jazz musicians including Marcus himself, Brandon Ruiters, Lwanda Gogwana and the excellent Neil Engel on Trumpets, and Athamacwera Ngcaba , James Bassingthwaite, John Davies, and Justin Sasman on trombones. The saxophones will include 2016 SAMRO Overseas Scholarships Winner Linda Sikhakhane, the lovely Linda Tshabalala, the international Sisonke Xonti, Cameron Ward and Janus Van der Merwe. Bokani Dyer, winner of the 2013 SAMRO Overseas Scholarships Competition will be part of the rhythm section with Romy Brautesth on Bass, Marlon Witbooi on drums and Sasha Sonnbichler on guitar. alumni|city will perform alongside a number of other big bands from various schools, including Pridwin P’zazz Jazz Band, the Johannesburg Youth Jazz Ensemble, the Cornwall Hill College Orchestra, St. Alban’s College Big Band, and the King David Jazz Band. 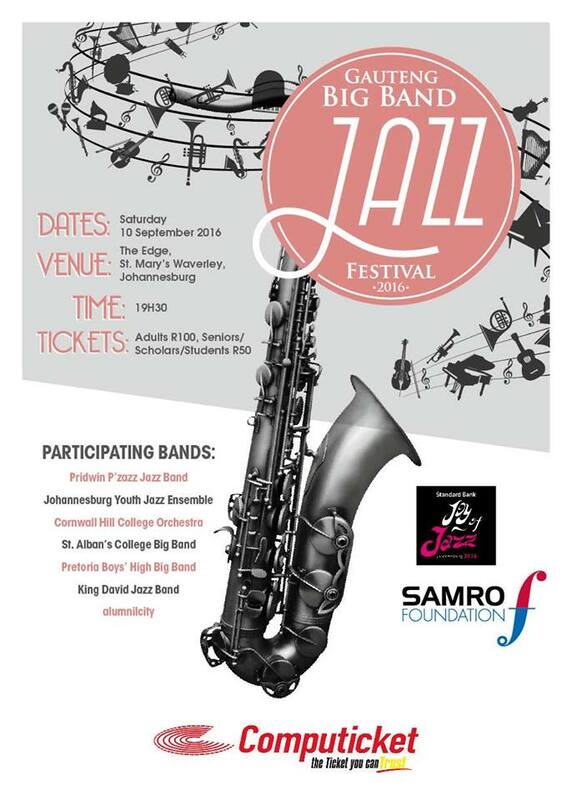 The Gauteng Big Band Festival forms part of the amazing Standard Bank Joy of Jazz festival with the support of the SAMRO Foundation. As the arts investment arm of the Southern African Music Rights Organisation, the SAMRO Foundation encourages youth music development and education through a number of initiatives and are proud to support the Gauteng Big Band Jazz Festival and the Cape Town Big Band Jazz Festival which are platforms that promote musical excellence and appreciation amongst scholars. Join these fine musicians in encouraging the students, teachers and parents who will explore the exciting Big Band repertoire from South Africa and abroad in a brassy one night extravaganza. Book tickets for the Gauteng Big Band Festival at computicket for the show which starts at 19:30 on Saturday 10 September 2016.